Urania (Ury) Vergara joined The Children’s Trust in September 2008. She brought with her extensive experience in government procurement, and contract management of state and local programs serving children and families in Florida. 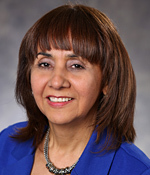 Prior to joining The Trust Ms. Vergara worked as a contract manager for the Early Learning Coalition of Miami-Dade/Monroe and served as a community based care contract manager for the Florida Department of Children & Families, District 11 (Miami-Dade and Monroe counties). Her experience also includes serving as a Vice Consul of Colombia in Miami, responsible for participation and development of local community organizations. Ms. Vergara has also been a volunteer for the American Red Cross of Miami-Dade and Monroe and the Seeds of Love Foundation. In January 2014 she successfully completed the requirements for accreditation and received a certification and status of expert (CCME) from the International Association for Contract & Commercial Management. Prior to moving to the United States in 1997, Ms. Vergara was a successful professional for a number of large-size companies in her native Colombia, where she earned a B.S. in engineering from Universidad de los Andes. She also completed a Certification of Studies (Funzioni Tecniche Aziendale) from Instituto per la Ricostruzione Industriale in Rome, Italy.